PLANET OF THE APES OR PLANET OF IGNORANCE? 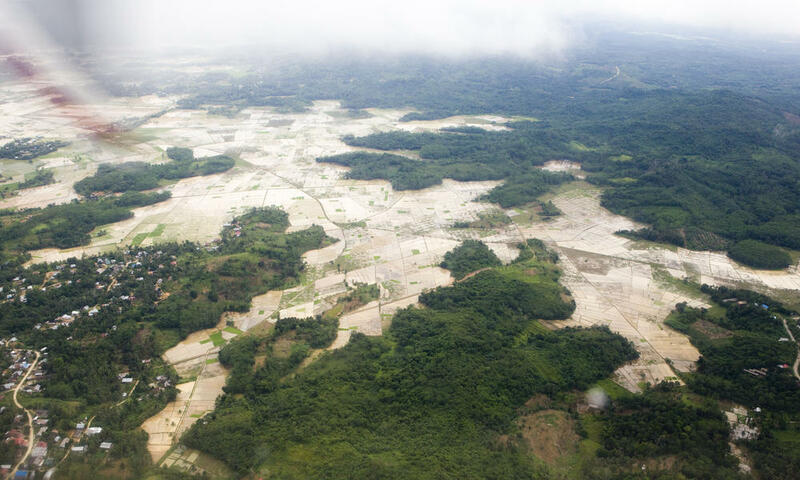 The Nature is bleeding and people do nothing to stop the horrible destruction of our Planet. It is getting worse with every new day; we are reaching slowly the bottom of our useless existence. Instead of protecting the wildlife, we are protecting our greed. Instead of saving the Earth, we are saving our egoism and ignorance. After the movie “Planet of apes” has questioned the human intelligence and offered the controversial thoughts about the progress of evolution, the portrait of humankind is not so brilliant. I do not know when and how, but the human race has betrayed Charles Darwin’s principles down on the road of survival. There is no surprise that animals show the higher intelligence as many people together as well as the emotional capacity. On the other side, Homo sapiens is falling into the trap of his own lunacy, selfishness and social disorders. 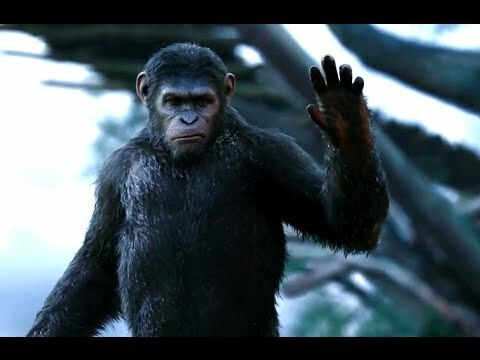 Who could ever forget the wise words of the progressed ape Caesar in the “Planet of the apes”: „Freedom is never free!” The message of the film is deep. It is not a typical Hollywood brainwashing but a philosophical observation of humans and apes relations through the history of organic evolution. The point of the movie is that power always changes those who have it, no matter who they are. Unfortunately, the people have power at this moment and they have destroyed their genetic similar sibling species, the apes. 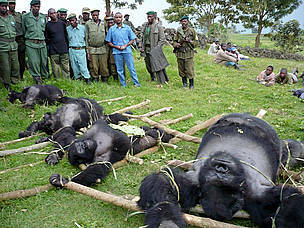 The majority of apes is really endangered and it seems that the terror they are under does not stop. Their natural habits are demolished, they are almost extinct. 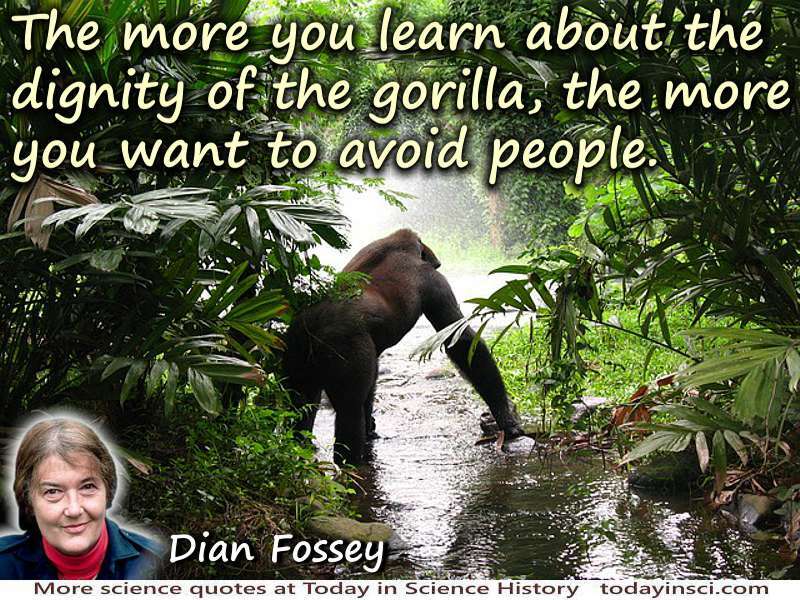 Among all of them, the mountain gorillas suffer in spite of the fact that they do not have many natural enemies. What is actually happening? 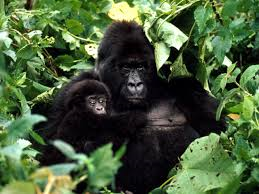 Those giants live in the African region, around volcanic slopes but due to the civil wars, poaching and unrest in the countries that share this area, the life of mountain gorillas is full of misery. Their number has dropped down rapidly but the conservation efforts and devoted work of animal rights activists color slowly their story into optimism. She was not a real scientist, she was a woman with heart to feel and to fight for voiceless. At the end, her scientific notes and observations has launched primatology in new direction. The public has finally seen the gorillas, as they are, the caring social animals with good nature and brilliant and adaptable mind. Their current position on the wildlife scale of endangerment depends on human activism against poaching and successful circulation of information regarding their number and importance. The global wildlife protection must be forced on the local authorities to implement it and to control and punish those who challenge it. 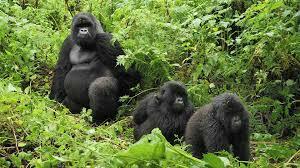 The majestic gorillas are not in the ownership of some national parks of Africa but the treasure of the whole world. They belong to this Earth and they have right to live here as much as we do. Their habitats and cubs should be legally protected from any kind of industrial abuse or violence. The communities that hunt or even eat the meat of these animals should be educated to know that this kind of bush meat is capable to infect the consumers with the dangerous emerging zoonotic diseases. After the campaign is united and linked to the legal consequences of non-respect for gorillas, I believe that their number will be on rise. There are no more excuse for our treatment of this wonderful planet. There are no more excuse for our treatment of animals and plants. There are no more excuse for our treatment of our human fellows. We are the most powerful species but still so poor, ignorant and even regressed. If gorillas look into the eyes of the humans, they will only find never-ending emptiness. Sarah’s imperative and succinct article brought to mind the evolution of the mountain gorilla (one of two subspecies of the East African gorilla): mountain gorillas are descendants of ancestral monkeys and apes found in Africa and Arabia, during the commencement of The Oligocene Epoch (34-24 million years ago). The appellation ‘Oligocene’ derives from the Ancient Greek ‘ὀλίγος’ (olígos -few) and ‘καινός’ (kainós – new), and refers to the sparseness of extant forms of molluscs. The Oligocene Epoch is considered a pivotal period of biological transition; a link between the archaic planet of the tropical Eocene Epoch and the more modern ecosystems of the Miocene Epoch. Major changes during The Oligocene Epoch included a planetary expansion of grasslands, and a regression of tropical broad leaf forests to the equatorial belt; perfect for what would become mountain gorillas. The fossil record provides evidence of the hominoid primates (apes) found in East Africa, about 22–32 million years ago. The fossil record of the area where mountain gorillas live is particularly poor, and so its evolutionary history is not definitive. It was about 9 million years ago that the group of primates that were to evolve into gorillas split from their common ancestor with humans and chimpanzees. This was when the genus Gorilla emerged. It is not certain what this early relative of the gorilla was, but it is traced back to the early ape Proconsul africanus. Mountain gorillas have been isolated from eastern lowland gorillas for about 400,000 years and these two taxa separated from their western counterparts approximately 2 million years ago. There has been considerable and as yet unresolved debate over the classification of mountain gorillas. The genus was first referenced as Troglodytes in 1847, but renamed to ‘Gorilla’ (a Grecian appellation applied by Europeans for an African tribe noted for their excessive body hair, the ‘Gorillai’), in 1852. It was not until 1967 that the taxonomist Dr Colin Groves proposed that all gorillas be regarded as one species (Gorilla gorilla), with three sub-species. In 2003, after a scientific review, they were divided into two species, by The World Conservation Union (IUCN). 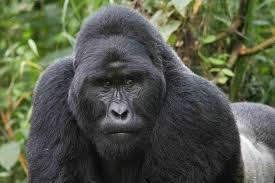 Primarily, the mountain gorilla is a herbivore: the majority of its diet is composed of the leaves, shoots and stems (85.8%) of 142 plant species. In addition, it feeds on bark (6.9%), roots (3.3%), flowers (2.3%) and fruit (1.7%), as well as small invertebrates. (0.1%). Adult males can eat up to 34 kilograms (75 lb) of vegetation a day, while a female can eat as much as 18 kilograms (40 lb). Though strong and powerful, the mountain gorillas are generally gentle and very shy; which might be a reference to their herbivorous diet. Severe aggression is rare in stable groups, but when two mountain gorilla groups meet, the two silverbacks can sometimes engage in a fight to the death, using their canines to cause deep, gaping injuries. For this reason, conflicts are most often resolved by displays and other threat behaviours that are intended to intimidate without becoming physical. The home range size (i.e. the area used by one group of gorillas, during one year) is influenced by availability of food sources and includes several vegetation zones. The mountain gorillas spend most of their time in the Hagenia forests, where galium vines are found year-round. All parts of this vine are consumed, the leaves, stems, flowers and berries. It travels to the bamboo forests during the few months of the year fresh shoots are available, and it climbs into subalpine regions to eat the soft centers of giant senecio trees. Thank you so much, Sarah, for such a heartfelt article ! Excellent research and Beautiful writing ! Again, it’s time humanity mended its evil ways of perceiving Gorillas, and all Animals, as our subordinates. Further, it’s time humans stopped torturing and killing all those poor, innocent, and defenseless Animals ! all other Animals is that “humans” are driven by greed and selfishness, whereas Animals are not ! 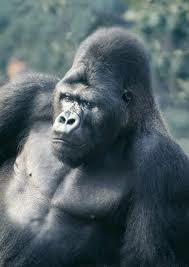 protect Gorillas and all Animals ! Thank you again, Sarah, for exposing the truth and for being a beacon of light and hope to the rest of us ! What can people do besides donate money? 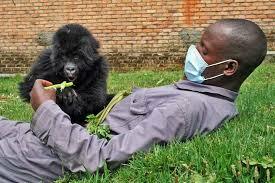 What is needed to get these beautiful Gorillas safe? Do you have a media / Special Donor events planner for making sure the most money possible comes in for safety, study, maybe even a safe relocation for the beautiful Gorillas? 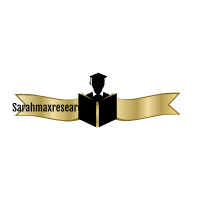 I have 20 year experience with Media Marketing, as well as Donor Awareness for Animals. I would love to help in any way. FRIDAY THE 13th: URBAN LEGEND OR PARASKEVIDEKATRIAPHOBIA?